The Little Giant Revolution is lighter than any comparable 300 lb-rated aluminum multiuse ladder. The Revolution includes several new patented features: the Quad-Lock™ hinge and the easy-to-use Rock Locks™ for quick adjustment. The Revolution can be used in dozens of unique configurations, as an A-frame, extension, staircase and 90-degree ladder, and as a trestle-and-plank scaffolding system. The Revolution’s wide-flared legs and aerospace-grade aluminum construction provide an unmatched feeling of safety and stability. 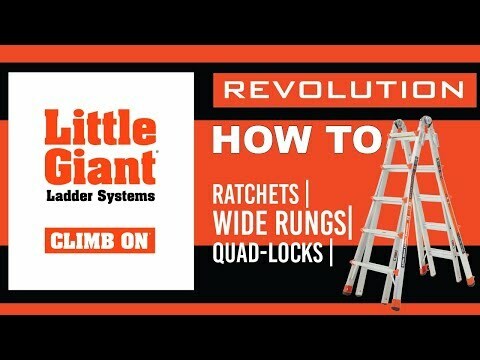 The Revolution is also available with Little Giant’s patent-pending dual Ratchet Levelers™, which adjust hands-free in seconds. These built-in levelers allow the operator to adjust to uneven ground in mere seconds. And when the job is done, the levelers retract into storage position. The levelers offer nearly 8 ½ inches of leveling adjustment. The Little Giant Revolution is rated Type IA to hold 300 lbs on both sides of the stepladder configuration. I have been using my brothers Little Giant for over 15 years. No other ladder do I feel safe on. Finally broke down and bought the Revolution XE 26. I have used it several times and it works flawlessly. Just as expected. If you can part with the money you will not regret it! Last year I received the Alta-One model 22 as a gift. I was super stoked to be getting a Little Giant Ladder but it showed up with one of the locks pushed in and the surrounding plastic damaged. I sent it back and waited for this years black Friday deals. The wait was worth it and I upgraded to the Revolution XE Model 26 with free six foot work plank. All these items shipped quickly and just in time for putting up the Christmas lights. My kids are happy for the lights and I never once felt uneasy on this ladder. I was shocked by how much I could reach with a maxed out A-Frame and the Rock Locks are my favorite, hands down. These locks make adjusting the ladder a breeze and they're a huge improvement over the locks on the Alta-One. Looking forward to many years of putting smiles on kid's faces. Bought my second and for Christmas, my dad's first. He's going to love it. I've used Little Giant in the navy back in the early nineties and have loved them ever since. Now it's easier than ever to buy and with all the handy attachments and deals this holiday season, how could you not buy one? This is the sturdiest, safest and most flexible ladder I have ever used! I plan on buying another this spring! This is truly the best ladder. It's so easy to use and has many positions and useful accessories. • Adjust to uneven terrain in seconds and enjoy an unmatched feeling of stability. • Use the right ladder for the right job every time and avoid 95 percent of all ladder-related safety issues. • Use the Revolution’s integrated Tip & Glide™ Wheels to move the ladder easily from place to place. • The Little Giant Revolution with Ratchet Levelers meets or exceeds all OSHA and ANSI standards and is industrial rated up to 300 lbs. Weight Capacity 300 lbs. 300 lbs. 300 lbs. 300 lbs. 300 lbs. 300 lbs. A-Frame Min. Height 4 ft. 1 in. 4 ft. 1 in. 5 ft. 1 in. 5 ft. 1 in. 6 ft. 1 in. 6 ft. 1 in. A-Frame Max. Height 7 ft. 1 in. 7 ft. 1 in. 9 ft. 1 in. 9 ft. 1 in. 11 ft. 1 in. 11 ft. 1 in. A-Frame Max. Highest Standing Level 4 ft. 9 in. 4 ft. 9 in 6 ft. 7 in. 6 ft. 7 in. 8 ft. 7 in. 8 ft. 7 in. Extension Min. Height 9 ft. 9 ft. 11 ft. 11 ft. 13 ft. 13 ft.
Extension Max. Height 15 ft. 15 ft. 19 ft. 19 ft. 23 ft. 23 ft.
Extension Max. Highest Standing Level 11 ft. 7 in 11 ft. 7 in. 15 ft. 6 in. 15 ft. 6 in. 19 ft. 4 in. 19 ft. 4 in. Storage Height 4 ft. 7 in. 4 ft. 7 in. 5 ft. 7 in. 5 ft. 7 in. 6 ft. 7 in. 6 ft. 7 in. Storage Width at Base 1 ft. 11 in. 1 ft. 11 in. 2 ft. 2.5 in. 2 ft. 2.5 in. 2 ft. 7 in. 2 ft. 7 in. Storage Depth 9 in. 9 in. 9 in. 9 in. 9 in. 9 in. Max. Footprint 5 ft. 2 in. 5 ft. 2 in. 6 ft. 6 in. 6 ft. 6 in. 7 ft. 10 in. 7 ft. 10 in. Rung Size Double Section 3.5 in. 3.5 in. 3.5 in. 3.5 in. 3.5 in. 3.5 in. Ladder Weight 33 lbs. 38 lbs. 41 lbs. 47 lbs. 52 lbs. 57 lbs. Shipping Weight 40 lbs. 45 lbs. 49 lbs. 55 lbs. 62 lbs. 67 lbs.